A simple one-bowl salad of everything, combines two cooking techniques in vegetables preparation -via roasting and steaming. The cauliflower and broccoli could have jolly well been roasted to charred-smoky deliciousness; but personally, I prefer my fresh cruciferous vegetables - steamed e.g. Steamed Purple Cauliflower, or stir-fried e.g. Stir-Fried Broccoli with Beech Mushrooms. Steaming, in this case, retains maximum nutrients using shorter time (10 mins or less), and lower cooking temperature 100degC steam-temperature. Directions: Preheat oven 400F. 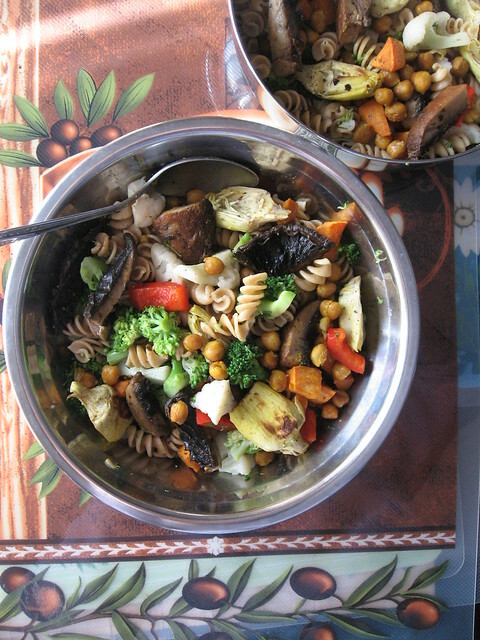 Place mushrooms, artichoke, chickpea, and sweet potato on separate trays. Season with salt and pepper, then roast in for 20-30minutes, checking halfway after about 12-15minutes (give the tray a good shake for uniform roasting), then finish roasting. Allow the mushrooms to cool a little, then slice them. 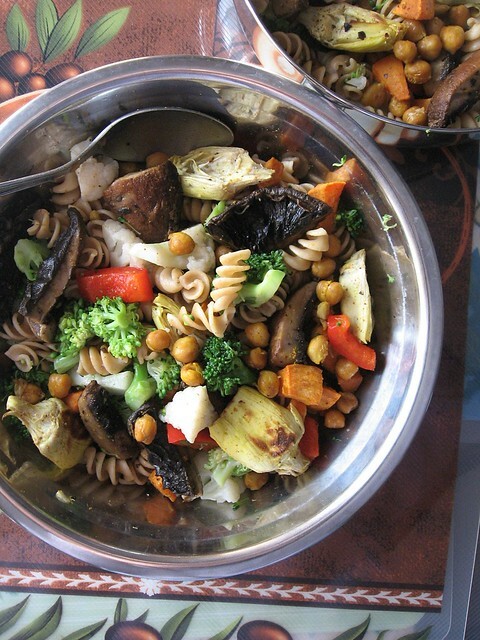 Add sliced mushrooms, artichokes, chickpea, sweet potato to a bowl and toss thoroughly. Add cooked pasta, and steamed cauliflower, broccoli, then mix well. There you have, everything healthy complete in a bowl - well-balanced and nutritious!